Today we travel back in time, to March 24th 1998. It is exactly 20 years ago that the first VEGETATION instrument was launched on board the SPOT 4 satellite. 20 years may go unnoticed in the evolution of the Earth, but leaves its footprint in the lifespan of a man. Not only because of the immense technological progress that was made, but even more for the growing importance remote sensing and geo-information play nowadays in our daily life. Growing awareness of the interdependence of environment, economy and social well-being resulted in 1972 in the Stockholm Conference, the first UN Conference calling upon all countries to manage the environment for the benefit of present and future generations. In 1992 the Rio Declaration and Agenda 21 followed, and later in 2000, The Millennium Declaration on Environment and Development with its Millennium Development Goals. The goal to monitor our environment and safeguard our livelihoods stressed the need for a European long-term commitment of space-based environmental monitoring services, as put forward by the Baveno Manifesto in 1998, the starting point of the GMES initiative, in 2012 renamed to the famous COPERNICUS programme. Our great and ambitious adventure started in 1997, a year prior to the successful launch, when the VITO Centre for Remote Sensing and Atmospheric processes (now called VITO Remote Sensing) signed its first CTIV contract (Centre de Traitement des Images de SPOT Végétation) with OSTC (now BELSPO), as part of the SPOT VEGETATION programme financed by the European Commission, France, Belgium, Sweden and Italy. The VEGETATION programme was setup to ensure daily global vegetation monitoring by imaging our Earth’s surface with a spatial resolution of 1 km. The programme was very ambitious, demonstrating European operational leadership in delivering high quality Earth observation products to end users in less than 24 hours after image acquisition. With 10 motived image processing experts we were ready to be a part of this challenging mission, busy controlling the production and distribution entities and operating the central image processing and archiving center, working in close collaboration with our Swedish and French colleagues. Since 1998 we’ve grown to a group of more than 150 professionals, working in the remote sensing and environmental monitoring research units. Satellite image processing in all its forms is still a core business, but in the meantime it is also complemented with new technological research in the field of airborne data and the development of innovative information products and services. To support the European GMES initiative, the VEGETATION programme implemented a free data policy in 2001, promoting the free distribution of its premium product, the 10 day synthesis VGT-S10. 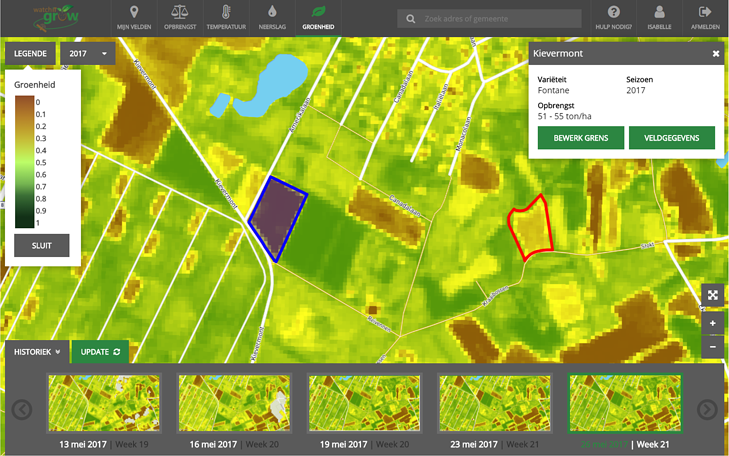 With its VEGA 2000 project, the CTIV processed global data acquired by the VEGETATION instrument for the year 2000. This was distributed for free to over 30 research teams across the world. But there was no cloud storage in 2000! Shipment in those days was still done via DVD and SDLT as per request. The general objective of the VEGA 2000 data set was to generate a harmonized land cover database over the entire globe for the year 2000, the year being a reference year for environmental assessment in relation to the United Nations’ international conventions. Under guidance of the EC Joint Research Centre, the VEGA 2000 images finally resulted in the Global Land Cover 2000 data set. This free and open data policy was later on fully incorporated in EC directives “Communication on open data” (2011) and “re-use of public sector information” (2013). 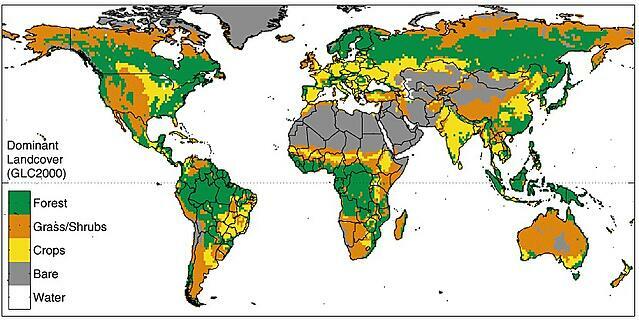 Over the years, VEGETATION satellite data has been used in a wide variety of research projects to monitor the global land surface (e.g. Geoland, BOSS4GMES), the carbon cycle and forests (GlobCarbon, GSE Forest Monitoring) and agriculture and food security (Global Monitoring for Food Security). Benefiting from the results of several research projects, and responding to the growing economic and societal needs, the Earth observation data and derived information products found their way into operational services for the European Commission’s Joint Research Centre, notably the Global component of the Copernicus Land Service, Copernicus Climate Change Service, the Monitoring of Agriculture with Remote Sensing or MARS. But also abroad, for instance by United Nations and the U.S. Department of Agriculture (USDA). Effectively serving thousands, around the world. That’s why we love what we do. Offering useful tools and consumable information to assist end users in making evidence-based decisions for sustainable development. 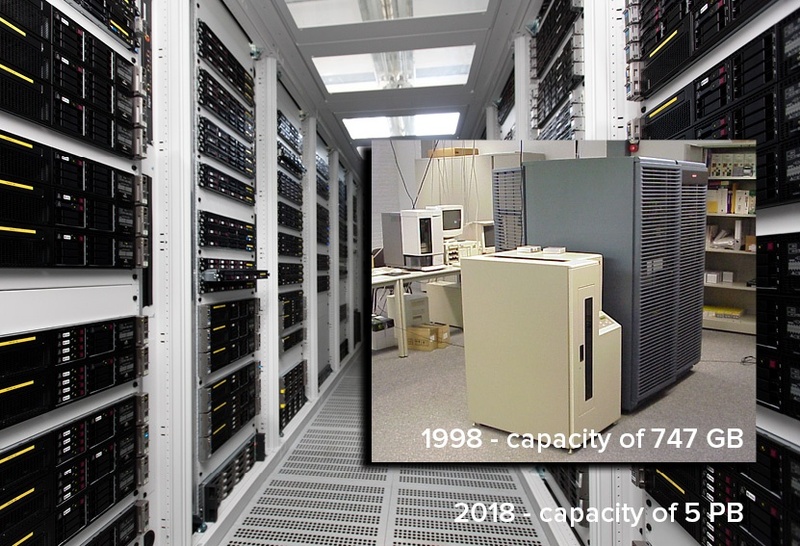 The image processing data centre in 1998 and 2018 (background image). On May 7, 2013 ESA’s small satellite PROBA-V was launched. With its 1-km, 300-m and 100-m resolutions, this instrument is the successor of the SPOT VEGETATION 1 and 2 instruments, carefully continuing the global vegetation daily time series for more than 20 years now. PROBA-V was designed as the gap filler between SPOT VEGETATION and the Sentinel satellites of ESA, and as the precursor of the SLSTR instrument on SENTINEL-3. The CTIV catalogue of the late 90ties has now evolved into a modern multi-mission VITO Product Distribution Portal, giving users free access to several data products a.o. SPOT-VEGETATION, ENVISAT-Meris, PROBA-V, AVHRR, Sentinel data. Nanosatellites and CubeSats, drones, big data, artificial intelligence and machine learning. Some of the technological innovations rushing by and transforming the geospatial information market. We are now in the middle of the transition from mass production of data and images to mass customization, with web information services, personalized products and user-centric solutions. WatchITgrow is an online platform which combines several types of data (e.g. satellite, drone, weather and soil data) to monitor and increase potato yields in a sustainable way. Together with colleagues from universities, the industry and relevant public bodies, we concentrate on developing new applications for our clients and try out new business models. We have extended our playing field from the national and European scene to the international and worldwide market. Interested to find out more? Contact us and see what we can do together. The VEGETATION programme was developed under the responsibility of CNES (Centre national d'études spatiales). CNES being responsible for the programming and control centres (CMP and CPV), the operation of the regional station (SRVL) and the image quality centre (QIV), and SSC (Swedish Space Corporation) for hosting the central receiving station in Kiruna (SRIV). The SPOT VEGETATION Distributing Entity was initially serviced by SPOT Image, but was later on transferred to VITO.